Our high quality English saddles are perfect for someone looking for a great deal on a beautiful saddle. These premium leather English style saddles will allow your horse maximum mobility while riding. 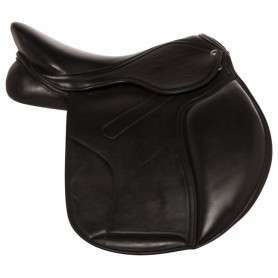 This black all purpose saddle is the perfect beginners package! Made with all natural cowhide lather, this saddle offers a higher cantle for trail riding, while also providing a lower pommel for jumping. Now only $179.99 today! This black all purpose English leather riding horse saddle features a comfortable padded seat and comes with the stirrup leathers and irons. Suitable for flatwork, jumping, or even trail riding! This saddle is on sale for only $189.99 today! This brown all purpose English leather riding horse saddle features a comfortable padded seat and comes with the stirrup leathers and irons. Suitable for flatwork, jumping, or even trail riding! This saddle is on sale for only $189.99 today! 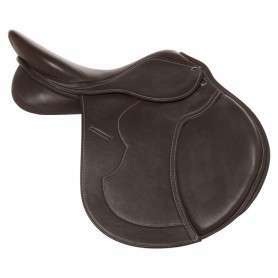 Dark Brown Eventing English Jumping Horse Saddle 16"
This brown jumping English leather riding horse saddle features a comfortable padded seat and detachable knee lift. Suitable for flatwork, jumping, or even trail riding! This saddle is on sale for only $799.99 today! This black jumping English leather riding horse saddle features a comfortable padded seat and detachable knee lift. Suitable for flatwork, jumping, or even trail riding! This saddle is on sale for only $799.99 today! 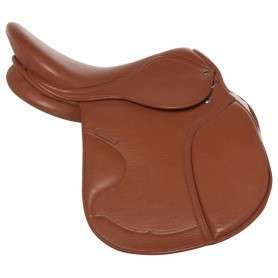 Tan All Purpose Premium English Leather Horse Saddle 16"
This tan all purpose English leather riding horse saddle features a comfortable padded seat that is suitable for flatwork, jumping, or even trail riding! This saddle is on sale for only $799.99 today!